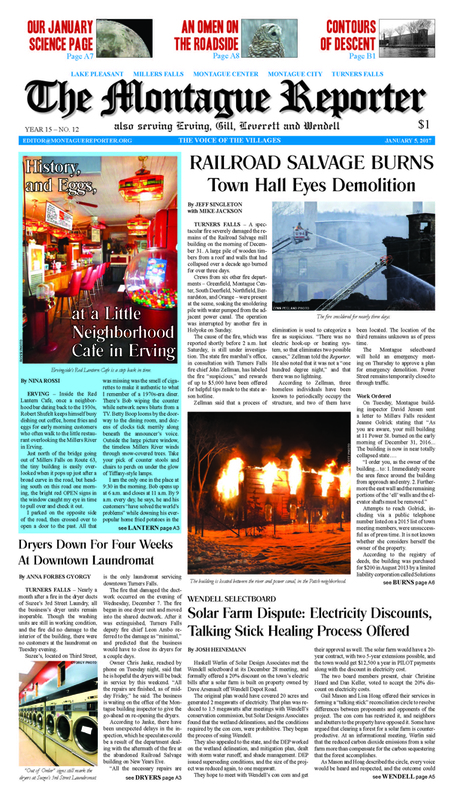 A dramatic fire engulfed the remains of the Railroad Salvage building on New Year’s Eve: full coverage of the blaze and its aftermath on page A1, and a timeline of this building’s rich history on page B1 of this week’s issue. In other news: laundromat patrons weather dryer drought; Wendell considers talking stick to solve solar dispute; Erving employees earn praises and raises; Gill considers everything from body cameras to birdhouses; Leverett makes an offer to an officer and hires a Web developer to build a system for public records requests. A bright red OPEN sign draws Nina into a little neighborhood cafe in Erving. NatureCulture: The Science Page looks at approaches to greening our environment and provides an update on Standing Rock. Our editorial calls upon the state to end solitary confinement. MoRe: the Gardener’s Companion heads to the UMass sun wheel to welcome the new year. TFHS athletes take to the courts and to the ice in another week of contests. A California organization customizes vehicles for wounded vets. The Young Shakespeare Players prepare to bring Richard II to life on stage. 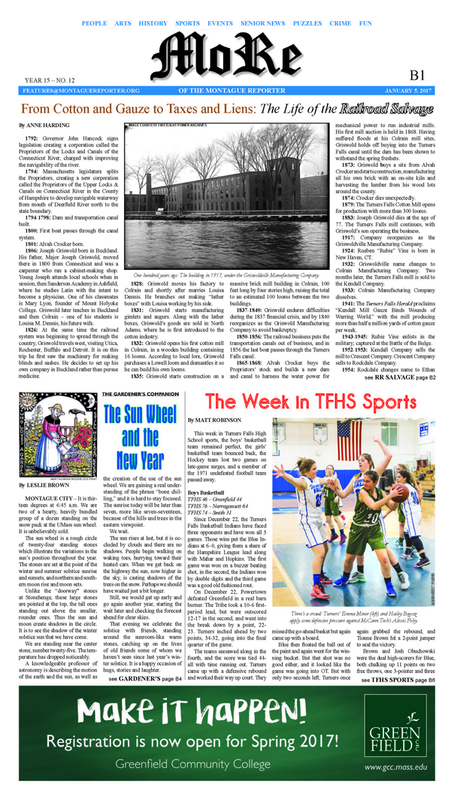 Plus: January library listings; Pet of the Week; This Week on MCTV; the Montague Police Log, and much more.